Darien High School hosts Greenwich High School in Class LL varsity baseball in Darien, CT on June 4, 2015. 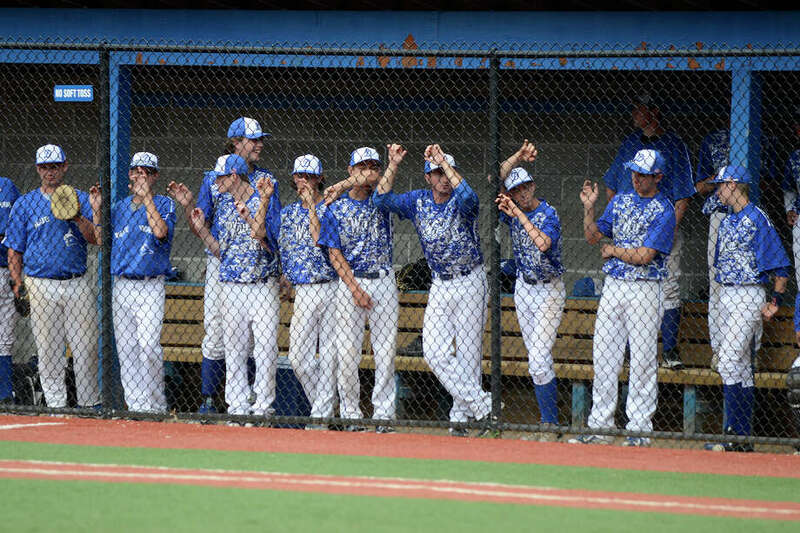 After Greenwich ended Darien baseball’s season in the second round of the CIAC playoffs the Blue Wave gathered in shallow right field, as they had done all season. But this time there weren’t laughs, there wasn’t teasing, the mood was undoubtedly somber. Tears fell from players who will never play an inning on the Darien High School turf again, thoughts wandered to what might have been and a misty-eyed head coached walked over to this reporter to answer the typical post-game questions. The 4-1 loss at the hands of the Cardinals was a momentary lapse for a Wave offense that averaged over 12 runs per game at the end of the regular season. Part of it was the outstanding pitching performance of Greenwich sophomore Anthony Ferraro. The rest was uncharacteristic base-running mistakes and a lack of timely hitting that up until that contest had been no issue for the Blue Wave bats. The message from Head Coach Mike Scott was simple; one game will not define the season. "They’re like our sons," Scott said of his team, namely the nine seniors that it started on an everyday basis. "Part of their success was they are talented ballplayers but they had that extra something, they were a confidence bunch and had that drive to win and expected to be successful. Certainly we had a tremendous regular season, to win a regular season championship was a huge accomplishment and then you get into the one-and-done tournament, which is not how baseball is meant to be played, and in the FCIAC any team can beat anyone on any day." Finishing the regular season with a 16-4 record gave the Blue Wave the regular-season FCIAC crown, but playoff losses to Wilton (conference) and Greenwich (state) deadened the hope of bringing hardware back to Darien High School. There is no question however that this team was special. Baseball often takes a backseat to lacrosse in the town of Darien, which has won both the boys and girls FCIAC and state titles in lacrosse the past two seasons, but this year’s team was determined to change that. "It’s not easy to be in a town where lacrosse is the sport in the spring but we feel that we have enough players that both programs can succeed and I think we’re on the way to changing the expectation," Scott said. "And this group had a lot to do with it." In each of the last three seasons Darien has improved its win total, culminating in an 18 win season this year. What was noticeably different with the 2015 squad was the confidence it exhumed, something transcendent with members in all levels of the program. "It’s different--you come to practice and guys are more relaxed because we’re at the top of the standings versus the .500 teams I’ve played on," senior George Reed said. "It was a progressive thing, guys were happy and we were working hard and guys wanted to get to the championship; at 10-10 guys can get lazy but winning makes you work hard." Reed is no stranger to working hard and the results that come with it. A two-sport star headed to play football and baseball at Union College Reed has seen his class succeed this year in all seasons. "The change my class had on Darien high school, the FCIAC title in football and both titles in hockey and lacrosse," Reed said of what he would remember most of his time at DHS. "And even in baseball when you’re normally not good and then we win the regular season FCIAC title and it something that no one expected and as we graduate people are going to expect for years to come." Reed tore his ACL in the fall, forcing him to miss the football playoffs, but underwent surgery and rehabbed in time to play baseball in the spring, something fellow senior Jake Frasca knows a little about. After suffering a fractured back a year ago Frasca was determined to be a starter on the varsity team in his final season. The shortstop/pitcher became the Blue Wave’s most productive hitter and will now head to Boston and Suffolk College where he hopes to have the same impact on their baseball program. "First thing I could say is, I was happy to be a part of it," Frasca said of the season. "I didn’t play at all last year before starting this year, it was difficult watching us last year but this year it was even more painful the way it ended. It was an awesome family we had this year, we worked our butts off every day in practice, we went hard against every team and we played our brand of baseball." To anyone who saw any of Darien’s 18 wins there was one glaring strength; the offense. Although senior ace Stephen Barston pitched heroically all season, finishing his varsity career with only two losses, the Blue Wave offense exhibited power and efficiency from hitters one through nine. Often times Darien would give up the first runs in the contest, but as Scott put it, as long as there were outs left the Blue Wave knew they had a chance. The perfect example was Darien’s matchup with Trumbull on May 6. The visiting Eagles came out and put four runs up in the top of the first inning. Darien responded by scoring five, highlighted by Reed’s two-run double, in the bottom half of the opening frame. Darien went on to win the game 12-5. "It’s something that starts with the type of kids on this team, they knew being down the game wasn’t over," Scott said. "That’s where it starts, the belief that we’re going to hit and we have to pitch and play defense and the offense is eventually going to show. For 18 of those games the offense was there and those six we lost we scored a total of five runs; its just those days where we didn’t have enough outs, it’s a tricky way to live in baseball since hitting is such a finicky thing but they never saw a pitcher they didn’t like—it was a lot of fun coaching this group." The bond this group had was rare, especially in high school where the roster turnover from season to season is magnified. Reed described it as ‘incredible’ to look around and see the success the team was having with kids he played with at six years old hitting off a tee. That bond, and the family that the Blue Wave became is what Scott says he’ll miss most. Over the success, over the dramatic victories, even over being crowned regular season champs. The accolades will eventually be forgotten in the annals of history, but the relationships formed are what will last a lifetime. "It’s the day to day things that no one else sees—the practices, the back-and-forth they had with each other and with the coaches," Scott said. "We were able to have that relationship between the players and the coaches where we really felt like one unit and in the practices it was guys being guys and playing the game and that’s the part I’m really going to miss."